"Blood shed in this world is real blood. This is no imitation world, no imaginary world, no metaphysical world. I guarantee you that. But this is not the 1984 you know." That's about as clear of an explanation the readers will get on the world of 1Q84. It's weird, I blew through the first 500 pages, and then put it down for a few days to reflect. It was during this time of reflection when I realized I had no idea what the hell this book was about. And even now after having finished reading it, I still have no idea what the hell this book is about...Is it a story about true love? star-crossed lovers? or in this case moon-crossed? In the end, I can only sum it up as a peculiar piece of magical-realistic, meta-fiction, and I still can't be sure that's right. I mean, we all know how those work. Why write that? ...Maybe it serves a purpose I'm not aware of. But things like that happen a lot. I guess that leads me to the characters, which are interesting in the beginning, as you learn their backstory, grievances and circumstance. The two central characters are Aomame and Tengo, moon-crossed lovers navigating Tokyo in the time of 1Q84. Aomame is a personal trainer and assassin. Tengo is a teacher and writer. Tengo and Aomame have very similar backgrounds. They have little social interaction and their daily lives are routine and boring. The only way I can differentiate them is to say Tengo is passive-passive, whereas Aomame is passive-active. They both let a lot happen to them and participate the minimum one can participate. Just flat. 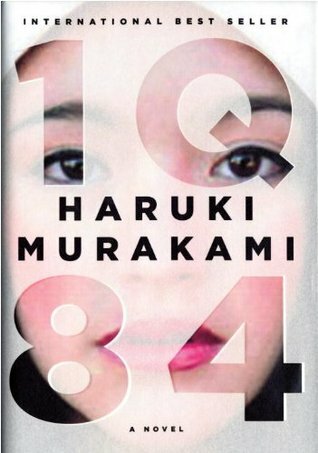 They reconnect in the year 1984/1Q84 after not having seen each other after twenty years...and there's not much more than that. They shared a very strong moment of connection in adolescence (a squeezing of hands together at school) Fast forward, Aomame assassinates a leader of a cult, who also happens to be exploited in a book Tengo has rewritten. That's the point of reconnection. Yes, there are whole bunch of other side characters and elements involved, but it's just too confusing and boring to mention. I don't know. I think it was too long, probably could have cut out 200 pages of useless description. It didn't bother me that I didn't understand how 1Q84 worked, it bothered me that nothing dynamic happened in the second half of the book. However, with all that said, I'm not completely turned off to Murakami's writing and I will read more of his stuff. This may have simply missed the mark...it happens.